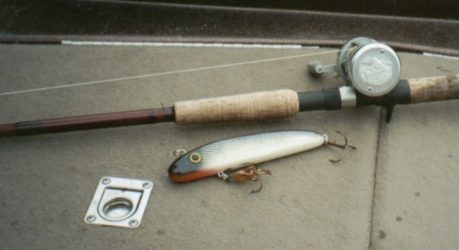 I've been asked many times about what kind of rods & reels I use so here are my favorites. The first picture is of my Shimano Calcutta 400 on a St. Croix 6'9" Heavy Power Premier Rod, Model number PM69HF. I use this combo for most of my heavier baits. This next season will be my fifth on the Calcutta and all I have had to do is oil it. I will however be taking it apart to clean and oil the insides before this season. Not that there is a problem with it, just want to be nice to it. Another Rod I like to use for snapping jerkbaits is a Lamiglas 6'3" Extra Heavy Rod, Model number GC 638. It really works great for 6" weighted Reef Hawgs by Fudally. One last thing, that is my favorite Ernie made by Musky Mania Tackle. Here is my favorite "bucktail rod" although I don't just use it for bucktails. I use it for all the lighter baits I use, like top water, spinnerbaits, small minnow baits, and one of my favorites the TR Twitcher pictured. The reel is a ABU Garcia Tournament Series, Model number T5600C. The rod is a G-Loomis 7' Medium, Model number MUR844C. The line I use is Berkley Ultra-Max but they haven't made it for many years now. I tie my own leaders with single strand wire. On the lighter combo I use 69#(0.018") test wire and for the heavy combo I use 126#(0.024") test wire. I do not use snaps on my leaders, I use split rings only, and leave the rings on the baits. Using lighter leaders and no snaps on baits really brings the action to life. Not to mention eliminating the possibility of a snap failure. The knot I use is a Palomar, it is very easy to tie and very strong with super braids. Here is a good description of fishing knots at Fishing Cairns. Notice the hook on the twitcher, that is a piece of Berkley Powerbait, I think scent makes a difference between follows and pictures....sometimes.